Over 46 percent of CFOs rely on "gut-feel" and instinct to make business decisions in lieu of fast access to accurate internal data, a practice that can delay decision making, introduce errors, and erode profitability. These are just a few negative outcomes stemming from the data deficit challenges CFOs face, according to new research based on a global survey* of over 1,500 financial decision makers announced today by Epicor Software Corporation, a global leader in business software solutions for retail, manufacturing, distribution, and services organizations. The research reveals that an inability to access the right financial information is having a direct impact on business performance and CFOs' reputations. Of those polled, 45 percent say poor data hampers timely decision making, and inaccurate information is the main cause of organizational mistakes. CFOs in the manufacturing/engineering sector were the most likely to have a basic/legacy financial IT infrastructure and a high necessity to rely on instinct for decision making. Survey results demonstrate that a lack of financial information was also shown to negatively affect corporate profitability. The more the CFO relies on empirical data for decision making, the greater the chances of higher profitability. Within the survey sample CFOs that rely on empirical data for decision making as opposed to instinct had greater profits, with 72% experiencing a profit increase. Nearly half of all CFOs (46%) said "increasing profits" was their top business objective in 2015. CFOs said visibility of financial information is often less than perfect in many areas; only around half surveyed felt they have "good visibility" of financial information including: overall and business unit performance, product line performance and profitability, sales and labor costs, sales forecasts, raw material costs, and customer profitability. 1 in 10 said they have "poor visibility" in these areas. While the survey data shows CFOs recognize the importance of data visibility and accuracy, it also makes a case for best-practice decision making being a blending of hard facts and emotions. "Instinct, intuition and even emotion was considered by a significant number of respondents to have a valid role in decision making, with the most effective CFOs knowing when to use their instincts to guide and add value in the way numbers alone cannot achieve, as opposed to just using it to fill information gaps left by inadequate processes and infrastructure," said Malcolm Fox, vice president, product marketing financial management and services industry solutions, Epicor Software. Amazingly, despite the wide availability of business systems and applications, 60 percent of CFOs said they still rely on Excel spreadsheets to gain access to data; this percentage was consistent across businesses of all sizes -- including corporations with over $1B in annual revenues. Nearly one-third (32%) surveyed say the financial IT system they currently use need updating and 27 percent believe that new / more advanced financial systems investment will deliver the greatest positive impact on their finance and accounting functions over the next 2 to 3 years. When asked about issues having the biggest impact on finance and accounting in the business over the next two to three years, the top response was big data (28%); other chief concerns included managing "regulations and compliance" and "increased complexity in the business." Another relatively new challenge that CFOs are grappling with -- and which is necessitating greater information accessibility and responsiveness -- is digital disruption. "Digital disruption has introduced more data sources, more channels, more numerous and complex business models, a more global nature of business, and more reliance on external partners. This is a real challenge for all business leaders but particularly so from the perspective of fiscal management and financial operations," said Fox. The level of collaboration necessary to do the job of the CFO has also increased significantly in recent years. Around half of those surveyed (52%) say that decisions are often made collectively; involving people from outside finance. "Today's business realities necessitate fast action and systems to support effective decision making. Old monolithic business systems are ill prepared to deliver the responsiveness that businesses need to succeed; mobile, social, analytics and many other technological innovations can assist organizations in this area," said Fox. Survey results demonstrate cloud strategies are fairly widely deployed by CFO ranks. Nearly half of CFOs surveyed have already deployed financial applications in the cloud -- such as financial accounting, CRM, HR, forecasting and budgeting, business intelligence, and financial consolidation and reporting -- or plan to do so within the next 12 months. Reducing costs (staff and capital expenditures) and support for remote workers were perceived to be the most compelling benefits to cloud deployments. Over one-quarter of CFOs (28%) say that financial decision-making is hampered by a lack of time and resources to make effective use of information -- contributing to one of the greatest CFO workplace hazards -- job stress. "Job stress is generally considered a key factor in CFO burn out, and with more and more responsibilities given to CFOs, there is a high propensity for overload. Having the right systems in place to support financial decision making can take some of this pressure off of CFOs," said Fox. Just under half (44%) of CFOs say that decisions are often made opportunistically to exploit situations as they arise. Having the right systems in place to foster organizational responsiveness allows CFOs to confidently take advantage of windows of opportunity. "Reliance on 'gut feel' versus empirical data can work out for many companies; however, erring on the side of financial conservatism may put organizations at a competitive disadvantage if CFOs don't have the confidence to allocate maximum resources for customer service, sales, marketing, and innovation (new product development, partnerships, etc.). On the flip side, over-confidence can cause organizations to miss market expectations, or even outspend revenues," said Fox. "You can never have too much information; the key is being able to get that information quickly and analyze it so it can aid smart, agile decision making for faster growth," Fox said. "The solution is to have a modern financial IT infrastructure in place that delivers the right data to the right people at the right time in the right way -- providing a solid data decision framework, and leaving the CFO free to add value in more creative ways, to collaborate and be confidently opportunistic." Epicor enterprise resource planning (ERP) delivers a simple yet powerful solution to the complex, dynamic and global business needs of modern finance organizations today and into the future. Delivering choice and flexibility with on-premises, Cloud, or hybrid deployment models from a single solution -- Epicor ERP includes a robust suite of financial management solutions which brings organizations together through more efficient accounting processes, shorter period closes and delivering key information to the business faster. 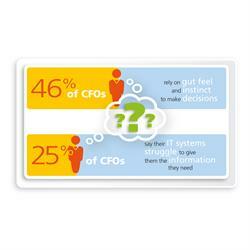 Do CFOs have the tools they need to make the best decisions for business growth? Insights from over 1,500 financial decision makers revealed in new study.